A great gift for anyone who enjoys the pleasure of Grow Your Own, or who loves cooking with fresh ingredients. The Sowing and Growing Tips also provide information about each variety included in the kit. The seeds are of US origin and each seed packet contains a minimum of 10 seeds! 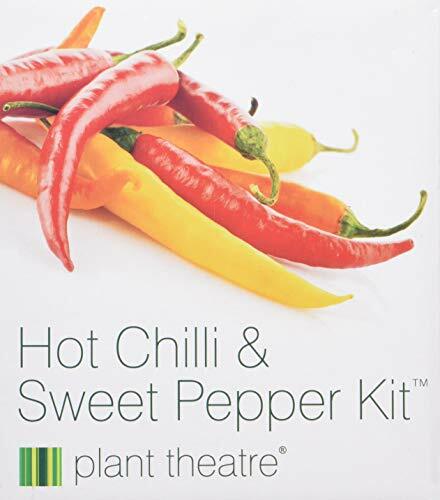 EVERYTHING YOU NEED TO START GROWING your hot chillies and sweet peppers in one box, we've left nothing out! Ideal for beginners, gardeners and children alike. INCLUDES 6 Peat Growing Biodegradable Pots, 6 Peat Discs that expand to 7 times their size when watered, 6 Plant Markers and of course 6 foil sealed seed sachets, plus full SOWING & GROWING TIPS. HEALTH BENEFITS - both red and green peppers are high in VITAMIN C, with red fruits very high in VITAMIN A too. Hot Chilli seed varieties include CHILLI HABANERO: uniquely coloured BLAZING HOT chillies, CHILLI DE CAYENNE perfect to spice up your culinary life and CHILLI PEPPER JALAPENO this superb variety produces excellent fruits that can be EATEN when GREEN OR RED! FANTASTIC sweet pepper seed varieties include: SWEET PEPPER FRYING MIX the largest of the sweet peppers and ideal for stuffing, SWEET PEPPER ORANGE SUN large tasty pepper ideal for salads and SWEET PEPPER CALIFORNIA WONDER with a crisp mild flavour and very versatile - it even has MORE VITAMIN C than an ORANGE!